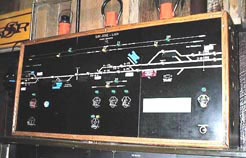 The SBHRS has two examples of Centralized Track Control boards in the museum. One is an SP railroad home built CTC board formerly used to control the tracks around the San Jose Depot. It was taken out of service and donated to the SBHRS museum in March of 1992. The other machine is a Union Switch & Signal built Centralized Track Control (CTC) board that was originally located at the SP Newark Tower. 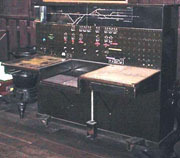 With this control board, the tower man controlled all train traffic in the area by operating levers on the panel. Circuits were closed and the appropriate signal or electrically controlled switch (turnout) was activated. The Newark Tower is located at the junctions of the Oakland to Santa Clara tracks and the Dumbarton Bridge to Niles Canyon tracks. There were two “wyes” at this location controlled by the tower. In 1985 the tower was closed and the CTC board was moved to the San Jose Depot where it continued to exert control on its former territory. The Southern Pacific Railroad took this CTC board out of service and donated it to the SBHRS museum in 1991. The Newark Tower CTC board is currently non-operational and is on static display. Future plans are to have a computer simulate train movements on the module’s display panel controlled by an operator who will change the signal and switch machines.